Buffalo Magic slot has a focus of the relationship between Native Americans and the Wild Animals of the great plains. Going back to a time before technology and mass construction, where indigenous population lived completely off the land and had spiritual connections with the animals that lived there. The music and sounds tap into this theme and you will notice this pretty quickly. Nothing beats playing a game for free, so why not have a few spins on this Buffalo Magic free play game. It is good to get a feel for the game before depositing and playing for real. It is a good idea to trigger the feature and see how the bonus round play out . Buffalo Magic is not dissimilar to other Novomatic slots such as Book of Ra Deluxe, Katana and Columus, all of which are available in free play. 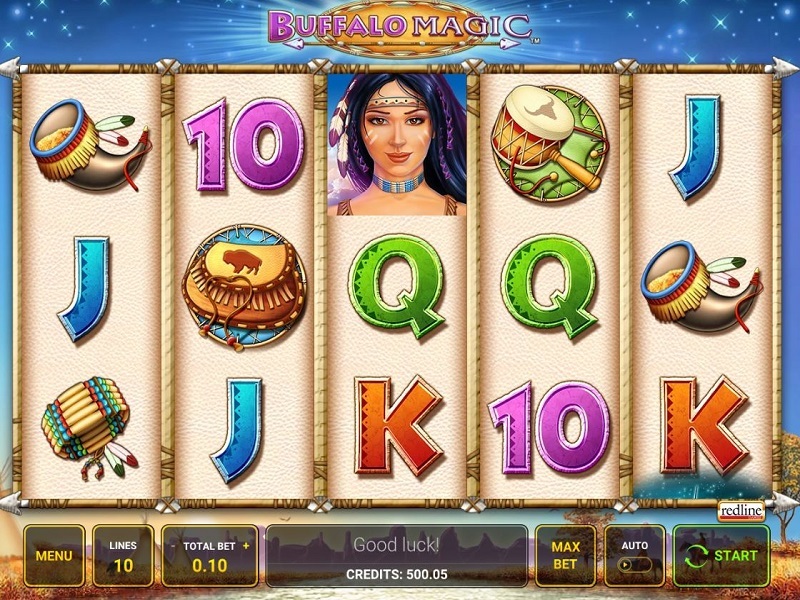 Novomatic bring us to North America with Buffalo Magic slot, a game with an Indian theme but much gentler than either buffalo slots such as Playtech’s Buffalo Blitz and Blueprint Gaming’s Buffalo Rising Megaways. For a start Buffalo Magic gives us only 10 paying lines left-to-right with all icons appearing as singles with a top pay of 200x for the character who is presumably Hiawatha. You can see Tepee scatters on the odd reels 1, 3 and 5 so we are assured of some kind of bonus being available and the even reels 2 and 4 have on them a ceremonial decorated skull which are the only positions we get to see a Wild. If you do see a Skull appearing on either or both of those even reels it will expand to a fully stacked Wild after which you’ll be paid and then get a re-spin with it held in position. If the second one lands the same thing happens, but if they both land initially on the same spin you’ll just get a single respin. If you land all three Tepee scatters on the odd reels you will earn 10 free games. If and when the expanding Wilds land they will become sticky for the remaining spins so you really need to see them early. You cannot get a full retrigger but if you do land 3 more Tepee scatters you’ll get 5 extra spins and whatever your situation when these 5 spins commence, they will be played with both Wild reels 2 and 4 fixed in place. Buffalo Magic slot is rather dull compared to other buffalo games such as Buffalo Thunder or Buffalo Spirit. The RTP is a 95.19% which too compares less favourably and you have little chance here of hitting any substantial wins if the bonus. The graphics and animations are limited and despite the lack of real potential the free games are quite hard to hit and you’ll rarely get much from the expanding Wilds either. Not a great deal of ‘magic’ here I’m afraid but you can play for as little as 10 coins so you may well get some low-risk entertainment if you try it. Greentube’s, the online development arm of Novomatic, created Buffalo Magic. It is set in an ancient land, full of wonders, mystery and potential riches. The game is packed with Wilds, expanding Wilds, respins and free spins as well. It’s time to visit this prairie and experience the natural wonder and hopefully some decent wins. The video of Buffalo Magic slot breaks down all the key elements of this Novomatic title. You will be able to understand all the key symbols of the game and where the potential wins are in this game. The bonus round is also broken down so you can figure out how it is triggered and what potential returns you can expect.